Environmental conditions could play a major role in the instigation of fights within the animal kingdom, according to new research. Scientists at the University of Plymouth have discovered that different flow regimes and oxygen levels within the marine environment are likely to result in conflict. Writing in the Journal of Experimental Biology, they say that conditions also play a key role in an individual’s resources of strength and stamina and – consequently – their success in such battles. The study is part of a long-term investigation into the behaviour of sea anemones, funded through a grant from the Biotechnology and Biological Sciences Research Council. Professor Mark Briffa and Dr Sarah Lane, from the University’s Marine Biology and Ecology Research Centre, have previously demonstrated the influence of both immune function and prior experience on the likelihood of fighting success. They have also shown that creatures who instigate fights are just as likely to suffer long term harm as those defending themselves. However, the current study could be particularly relevant amid continuing changes to the marine environment brought on by global warming. 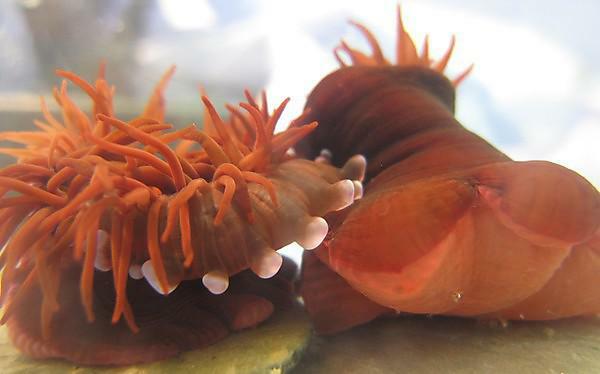 The study focused on the beadlet sea anemone Actinia equina, which is found in large quantities on coastlines across the UK. Scientists exposed some creatures to decreased levels of oxygen (hypoxia) within tanks and then examined their willingness to fight over a prize they would encounter in the wild, fast-flowing water. The results showed those anemones who had been living in aerated water were more likely to initiate combat, and more successful in it, than their oxygen-deprived rivals. However, those housed in hypoxic conditions were still willing to start fights – and succeeded in them – against those from similar conditions. The full study – How does the environment affect fighting? The interaction between extrinsic fighting ability and resource value during contests by Sarah Lane and Mark Briffa – is published in the Journal of Experimental Biology, doi: 10.1242/jeb.187740.